Theatermania.com made a list with the top ten stage performances of 2012. Yvonne is on number 4, for her role on Broadway's 'Golden Boy' as Lorna Moon. 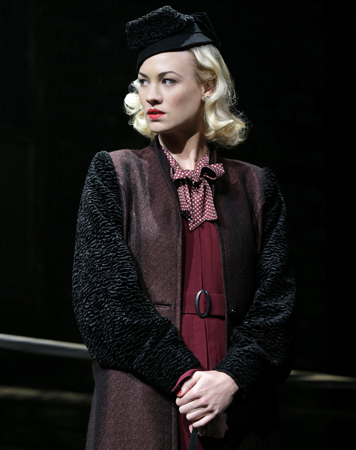 "Australia's Yvonne Strahovski had never even seen a Broadway show when she made her American stage debut in Lincoln Center Theater's revival of Clifford Odets' period drama. Yet the blonde bombshell, a fan favorite on the TV series Chuck and Dexter, gave a knockout stage performance as Lorna Moon, the "Tramp from Newark" love interest to costar Seth Numrich's boxer, Joe Bonaparte. Strahovski infused Lorna's chilly exterior with humanity, and delivered zingers like a champ with an impressive 1930's Noo Yawk accent. Lorna Moon might be a stereotypical moll on the page, but Strahovski turned her into a living, breathing, and deeply damaged human."